It’s February and we all know what that means: our one-month free trial of 2019 is over. Just kidding. The coming of February, of course, means that Heart’s Day is just around the corner. And I’m sure we all have someone special we’d love to see smile in this season of love. But before heading to the nearest shop to grab some chocolates or a nice bouquet of roses, you might want to stop and re-think your gift choices. Do you really want to give your special someone the same old high-calorie sweets, or the usual bouquet of flowers that won’t last for more than a week? Come on, guys. It’s 2019. This new year, take your gift-giving to new heights and surprise your loved one with well thought-out presents! Don’t worry, though. When I said new heights, I didn’t mean financially. After all, good gifts aren’t measured by how expensive they were, but how much love you’ve given in choosing or preparing them. And there’s a great deal of possibilities out there. It could be overwhelming, but here’s a little list to help you out. For Valentine’s, people have been giving away flowers by the bundle since time immemorial. And while it’s definitely sweet, it’s getting really old. And well, really impractical, with the inflation and all. Good thing, though, some people got so bored with flower bouquets, they got creative and spiced it up—some of them, even literally. If you’re a frequenter of social media sites, I’m sure you’ve seen food bouquets made of chicken nuggets, doughnuts, various snacks, and even Ferreros. There are also non-food. There are also these cute mini bear bouquets and Hello Kitty arrangements. The Internet’s got lots of other suggestions. 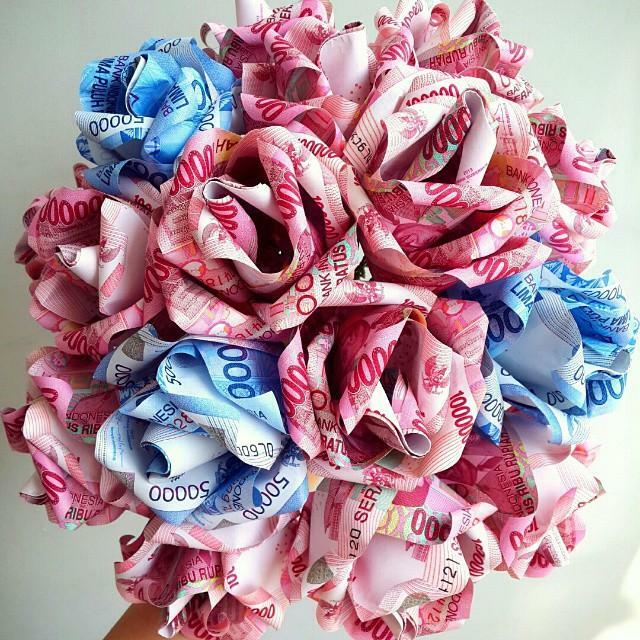 Though, I guess, this money bouquet wins the cake. Anyway, if none of the above sparked your interest, you could totally go the DIY route! Just think of something your special someone loves or needs that would look good when presented in a bundle. It could be anything from colored pens, art supplies, or isaw. Really. Go no further than your own kitchen and whip up something for your love. It could be a special dinner that you prepared yourself or a batch of warm, freshly-made cookies. You could also try making your beloved’s favorite dish, or maybe make something they’ve never tried before. If you’re really averse to pots and pans, though, you could try making handmade craft. A scrapbook of your memories, something knitted (which is, by the way, perfect for this weather! ), or even some little piece of furniture that they need. You don’t need to be blessed with culinary talent or artisan skills to try this one out. After all, taking the effort to learn something new just to surprise someone makes a gift a lot more special. Nothing says “I care for you” louder than a care package. Obviously. Kidding aside, a care package is especially ideal for those in long distance relationships, but there’s absolutely nothing wrong with trying this one out even if you see your sweetheart every day. One of the best gifts you could possibly give is a personalized package containing things that are meant to make your loved one feel that you think about their needs or that you’re always with them wherever they go. Aside from being personalized, it’s also very easy to make. All you need is a presentable and durable box and a grocery list of care items. This may include vitamins and medicines like pain-relief ointments (shout out to us, tito’s and tita’s with premature joint pains), toiletries, and even beauty products like face masks and makeup. You may also include office supplies and stress-relievers like fidget toys. You can even make it sweeter by writing notes on why you included each item! And no, I don’t mean you guys cool off or break up. What I mean is letting your partner get some rest from their daily routine. Encourage them to take the day off and take them somewhere relaxing or fun! This could be anything from a stroll in some quiet park to a full-blown vacation away from the city hustle. If your partner is a stay-at-home or hands-on mom, I’m sure they’d also appreciate being relieved from the mommy duties for a day. As their partner, you probably know whatever it is that’s been causing your loved one a great deal of stress. This Valentine’s, take the time and effort to remind them that they’re not alone in facing those and you are a tag-team. Besides, some people won’t even ask for gifts; they’d really just want you to be there. And there you have it! As mentioned above, this list is just something you could start from. There’s a whole lot of other things you could give or do for that special person in your life this Valentine’s. To those of us who haven’t found the one yet (or aren’t really looking), you can definitely use the ideas above to make your Mom and Dad, siblings, or close friends feel some love this February. After all, we’re currently under a cold spell and everyone could use some warmth.